What if your partner or parents simply demand it? ("Why don't you give me your password, are you hiding something?".... does this sound familiar?). That people you trust don't respect your privacy! That's it! Your device is Secured! - "Access to this device is monitored. 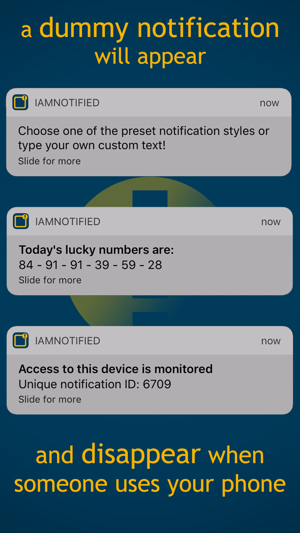 Unique notification ID: #securityID#"
- Secret Lock -> Launch iAmNotified without anyone near you noticing. When the option is activated, a black dimmed screen is shown when the app is opened, simulating the lock screen. 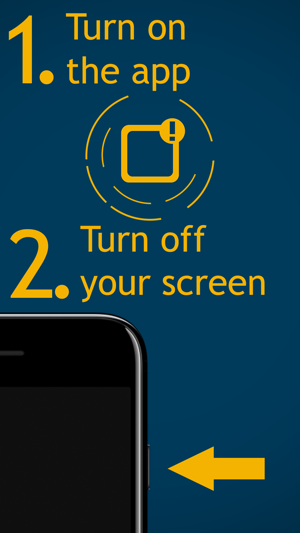 Now you can secretly press the lock button to lock the screen, or wait for it to lock automatically. To access the app with the option activated, simply tap anywhere on the black screen. 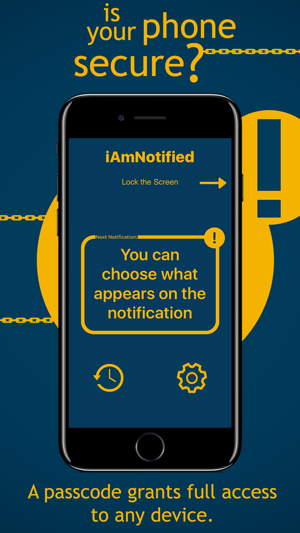 If you like how iAmNotified protects your device, please let us know with a review :) . 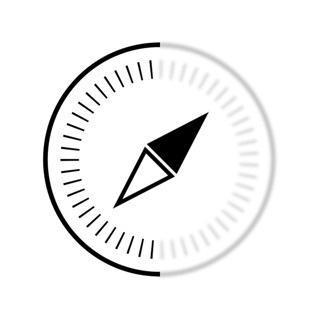 Also send us feedback or request new features by email and socials! The stealth option does not change the app icon or display name. At least the name change would be nice. It is automatically opened at unlock which must be how it time stamps. But again even with the black screen option it only takes a snoop one nondescript tap to get into the app and see what it really is. Suggestions. Stealth notification should display decoy icon/name. Not sure how this is accomplished programming wise but it can’t be impossible. Also to disable black screen you should have to enter a certain touch/motion combo not one generic tap, ex) tap three times in left corner then rotate to landscape view. 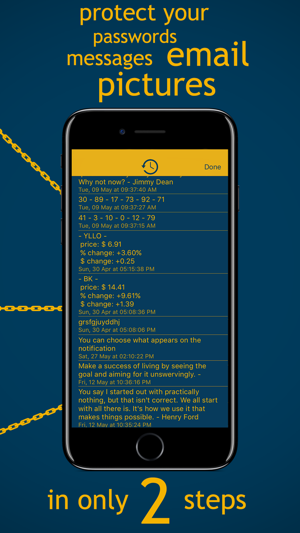 Thanks a lot for downloading iAmNotified and for the review! I also agree that changing the name of the app and the icon in the notification would be fantastic, it was in my features list, but unfortunately iOS does not allow to modify those. 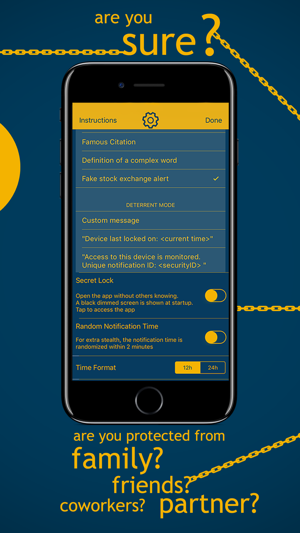 Also the opening of the app at unlock, is not controllable by the developer. It is the same with all other apps: if you lock the screen from any app, it may open again or not at unlock, depending on the resources needed by the phone, which may kill apps that are running in the background. I also get your point on the black screen, but the main function of that option is to "hide" the opening of the app, before you lock the screen, so people around don't notice that you have activated it. It is not mean to keep people out of the phone or the app. Such a simple idea and easy to use app! I'm less worried when I leave my phone around now! Thanks!